It's too easy to focus on stories of failure: A new study looks at the strategies male minorities use to succeed in school. Why aren’t the best and brightest minority students landing at elite colleges? A new study suggests we’re asking the wrong question. 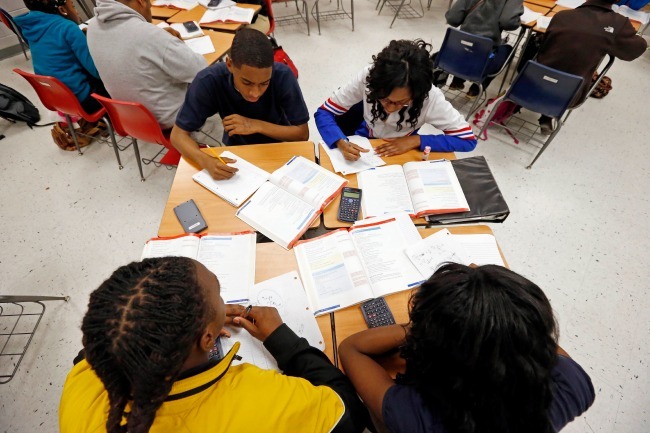 In his research on achievement by black males in higher education, University of Pennsylvania Prof. Shaun Harper--director of the Center for the Study of Race and Equity in Education--didn't try to answer why their college failure rate is so high. Instead, he set out to see what could be learned from the students who were succeeding. As a follow-up to that work, Harper has focused on young men poised to make the leap into higher education. Harper and his team of research assistants recently interviewed 325 New York City high school students of color--just over half were black, and 43 percent were Latino. Roughly half the students came from single-parent homes, and close to three-quarters of them would be the first in their family to attend college. Most of them were from working class and low-income families. The students were drawn from a mix of 40 campuses with varying records of prior academic success. These were not the city’s elite exam schools, although many of them had smaller student bodies than is typical. College recruiters rarely, if ever, visit these schools. At the schools the research teams found innovative principals and dedicated staff often taking on multiple duties in order to make sure students’ needs are being met. The campuses were not charter schools, Harper said, adding that “people erroneously conclude that these kinds of environments can only occur in charter schools.” But it’s also worth pointing out that the campuses are offshoots of New York City’s initiative to break up massive high schools into smaller learning communities with hundreds (instead of thousands) of students. In some cases individual high schools in the study shared a building with other programs, each on its own floor. Staying on track can mean staying indoors. When asked how they avoided being drawn into gang activity in their neighborhoods, many of the students said their parents prohibited all outdoor activity after dark. Some students said that having a reputation as a serious scholar headed for college actually protected them from gang conscription. Many of the respondents also stayed on campus long after classes ended for the day in order to do their studying and hang out with friends, often as a means of avoiding the disruptive neighborhood environment. Guidance counselors are overwhelmed. Harper found plenty of examples of hardworking counselors with absurdly large caseloads of students (you won’t have to go far in just about any school district in the country to find similar scenarios). Harper said this is one reason why so many promising students are winding up at middling colleges instead of applying to elite schools where spending per student is significantly higher and far more students graduate. (It’s also a phenomenon described by researchers Carolyn M. Hoxby of Stanford and Harvard’s Christopher Avery as "undermatching.") Harper offered one striking example: a student Harper described as the brightest he met during the course of the research project applied to just one college: Penn State-Altoona. “This kid could go to Harvard or the University of Pennsylvania,” Harper said, adding that he planned to make it his personal mission to ensure the student expanded his horizons. “Getting in” is not enough. The research team also spoke with 90 young men, also black and Latino, who had graduated from the same high schools within the past four years and were currently enrolled in college. Harper determined that many of them struggled to make the transition from their supportive high school environment to the more independent college experience. Students said they had difficulty with time management--in high school, teachers were careful not to overload students with competing assignments due on the same day, and a student who asked for an extension would likely get one. The deadlines in college, students quickly realized, were far less flexible. That’s one reason why support systems and mentoring continues to be critical to ensure young men of color “are prepared to succeed and persist through graduation,” Harper said. The voices captured in the report are ones not being heard enough, Harper contends. He urged a roomful of reporters to keep in mind how quickly he was able to locate 350 high-achieving black and Latino students just by asking their principals to identify students who met a few basic demographic parameters, such as having at least a 3.0 grade-point average, being involved in extracurricular activities, and having expressed a desire to continue on to college. "We could easily believe no young men who would fit this profile," Harper said. "If we choose to look for young men of color in an urban context who are doing well, we are likely to find them."